Japan has a reputation for being about as homogenous as a country can be. But the people who would eventually become the Japanese weren’t always from the island nation. They came across the sea about 2,300 years ago, and when they came ashore, they were greeted by the people who came before. Meet the Ainu. 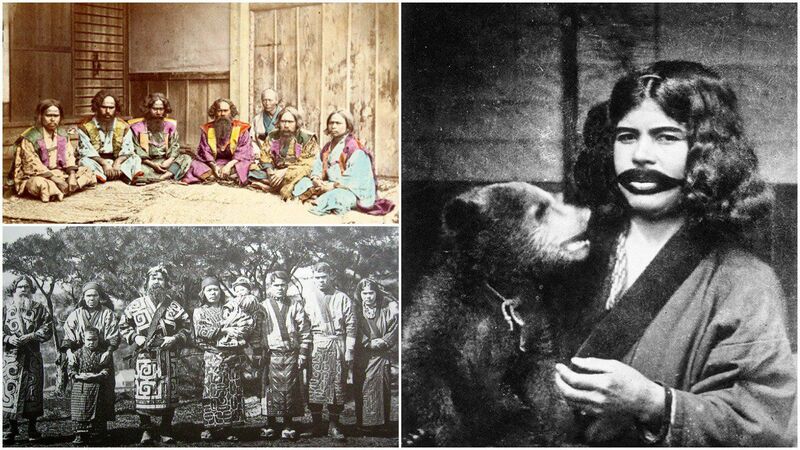 The Ainu language is unrelated to any other known language on the planet, and their religious and cultural traditions don’t have much to do with any of their closest neighbors’. They also look different from the greater population of Japan. They have thick, curly hair that often grows blond or red, their eyes range from brown to blue, and their skin is paler than their Japanese neighbors. And as so often happens, they’ve suffered terrible injustices as a result of their differences. As the country of Japan grew, the Ainu were pushed farther and farther north, until ultimately they were relegated almost entirely to the frigid island of Hokkaido. But in 1899, the Japanese government took inspiration from the treatment of indigenous people in the American West. Under the Meiji Restoration, the Ainu had their traditional lands taken from them and their language and cultural practices were outlawed. It’s a depressingly familiar story, and the damage done is only recently being addressed. The statue at Shiraoi Ainu Museum is one of the country’s best museums about the Ainu, the indigenous people of northern Japan. Hokkaido, Japan. It almost seems strange to talk about when the Japanese came to Japan. But human beings didn’t evolve there, obviously, so at some point, they must have come over from the mainland. What we do know is that there were people on Honshu, the large central island, as early as the 14th millennium B.C.E. Modern historians call this the Jōmon, or “cord-marked”, period, after the particular patterns on the pottery of the time. We know that the Jōmon people weren’t the last ones to migrate to Japan, and that’s led some people to believe that the Ainu and the Jōmon are one and the same. It does make some sense. If the Ainu are the descendants of an ancient people that predated modern Japanese society, and the Jōmon were an ancient people who predated modern Japanese society then… well, there’s your answer, right? One of the other main pieces of evidence in favor is the fact that both cultures are/were primarily hunter-gatherers — there was very little evidence that either practiced widespread agriculture. But there are some problems with that theory as well. First of all, there isn’t much in modern Ainu culture to suggest the affinity for pottery that the Jōmon people had mastered. The Ainu also built permanent aboveground dwellings, unlike the Jōmon, and made use of metal tools. But one of the biggest nails in the theory’s coffin was the discovery of a seed repository in southern Hokkaido. It suggested that the Ainu and their ancestors actually were practicing agriculture several thousand years ago, severing one of the only firm links between them and the Jōmon. We might never know for sure when and where the Ainu came to Japan, but we can say this for sure: any culture that raises bear cubs like human children should definitely be taken seriously.